Bridge Road Brewers has released a number of beers in pairs in the past couple of years. Each time, the idea has been to highlight the manner in which one change to ingredients can alter the final beer, be that the choice of barrel or yeast with which the two beers are developed. 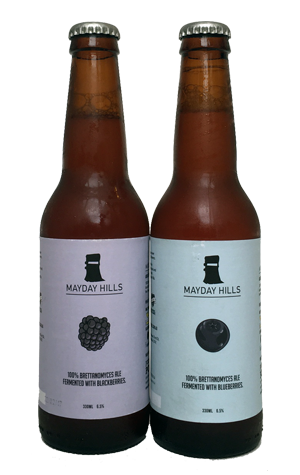 This time around, for the third release in the Mayday Hills series – beers that are fermented in the oak foeder at the Beechworth brewery using nothing but Brettanomyces yeast strains – the sole difference between Black and Blue is the choice of fruit. Two separate, but identical, batches of the base beer were brewed and into one was added 100kg of freshly picked blackberries from nearby Ovens Valley; into the other went the same amount of blueberries. Both have taken on a pink/reddish hue from the fruit, the additions of which also caused the beers to develop a level of acidity. The outcomes are quite markedly different. Black is sweeter on the nose, with aromas reminiscent of Ribena, albeit with a touch of background funk. It's like a full-bodied, gentle sour to which a fruit syrup has been added. As for Blue, the blueberries give it a more angular feel to the fruity aroma, while there appears to be something woody there too. On the palate, it's sharper and drier, giving it a more vinous feel than its partner.